Please welcome reader Abbi Adest for today’s interview. She blogs at Confessions of a Startup Wife. Describe your mother’s cooking style when you were growing up: My mother almost always had a hot meat dinner for us during the week. We ate a lot of meat, especially steaks and chops, usually with a baked potato on the side. 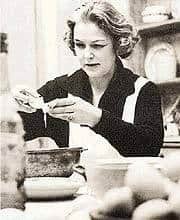 She was and is great with meat and chicken preparation—she knows how to time roasting for any type of meat or chicken perfectly (her chicken and turkey white meat was always juicy but well cooked; roasts were always medium rare and tender). I try to use her timing as much as possible, but it’s harder because Israeli meat is often of poorer quality. She wasn’t creative with side dishes: Her piece de resistance was egg barley baked with onion soup mix and margarine. There was also rice with soup mix or rice pilafs from a box. We always had a veg as well, she loved to make asparagus and artichokes, and her meat and vegetable soup is still my favorite. How is your cooking style different from hers? I love to experiment with spices and more ethnic cooking styles, especially Middle Eastern and Indian cooking. I love to make tagines and curries. I also serve way less meat than my mother did at home, mostly because we just can’t afford it. I also love vegetarian cooking, although my mother loves it too now. How did you learn to cook? I learned to cook because my mother needed the help. The first dish I made completely by myself was a roast duck in 5th grade. My mother was coming home late, and it was close to Shabbat [when cooking isn’t allowed]. She called me frantically from work and ask me to get it ready (or maybe also put it in the oven? I can’t remember). She told me where the recipe was and I remember trying to figure out how to get the toothpicks just right so the fat would drain properly from the skin. I think it turned out pretty good. 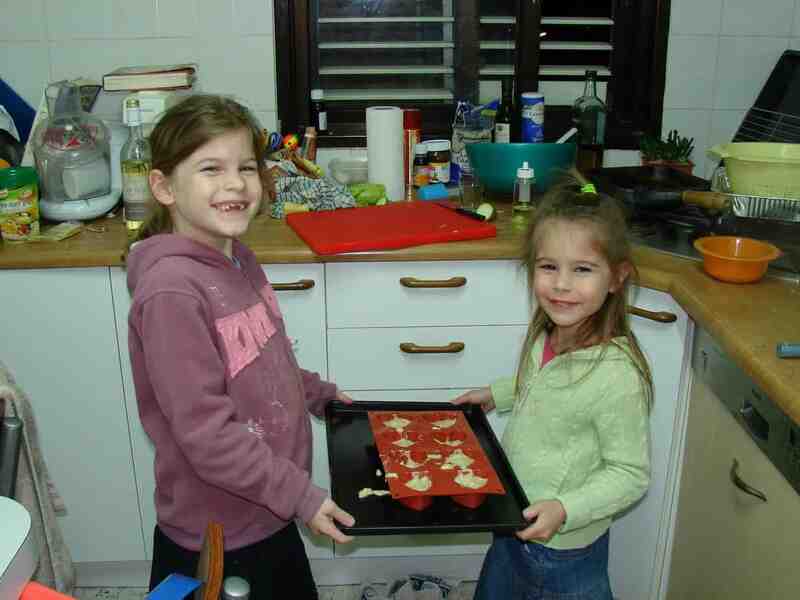 From then on I was responsible for most of the the Shabbat cooking in the house. When I left home at 18, my parents’ friends asked if I was going to freeze food for my parents and how would they ever manage! How has your cooking style changed over the years? My cooking has become more vegetable-based, even though I still love meat and chicken. I like to have meals with an animal protein main and a starch and 3-4 vegetable side dishes. I love emptying out my vegetable bin. What cookbooks do you recommend? In terms of cookbooks, in high school I heavily depended on the Chabad Spice and Spirit. It was a great cookbook for beginners. I remember I had a streak of challah baking one time and I tried every recipe in that book over a few months. By the end the pages stuck together from the accumulation of flour and water. Late in high school I discovered Mollie Katzen. I stumbled upon the Moosewood Cookbook while staying with a college friend over a snowy weekend in Binghamton. I absolutely loved her approach to vegetables and vegetarian cooking. It was a real eye opener. I brought that book and Enchanted Broccoli Forest to Israel for my year in seminary and spent the bulk of the year shopping at the shuk and trying out all her recipes. I was known for always having a pot of soup in my fridge. After college, I discovered Claudia Roden and Gil Marks. Their Jewish cookbooks, complete with stories and histories, fascinated me and I still use recipes from them to this day. Now I’m on an Elizabeth David kick (that’s her on the right). My parents just brought me three of her recipe/article collections. There’s a recipe for chicken livers with lemon zest and pasta that I’m dying to try. Do you entertain? I like to entertain only on Shabbat with at most two families. I find it hard to host more, especially when the other families each have 3 kids (our place is a bit small for 9 kids running around). I prefer to have one family. I love to bake with my girls and I hope my love of cooking rubs off on them! Slice the eggplants lengthwise and place on a baking sheet. Sprinkle with salt and pepper, and drizzle with olive oil. Roast in the oven for about 30 minutes at 200 C. Let cool and place in a plastic container. The next morning, cut eggplant into bite-sized pieces. Dice tomato, crush and finely chop the garlic and mix together in a bowl. Squeeze half or all of the lemon, according to your taste. Add chopped herbs, onion and pickle if you like. Drizzle with more olive oil and serve. Note: You can prepare all of this in advance, but don’t add the tomato until right before you serve. The cut tomato will gets yucky overnight. Elegantstarter idea: Wrap slices of firm avocado with smoked salmon slices. Arrange on a small platter. Serve with a sauce of mayo and whole grain mustard thinned with a little lemon. (This generally gets rave reviews and even kids tend to like it). Thanks for these questions Hannah, it was a lot of fun. Tagines, curries and more vegetable-based food: more or less what I enjoy. Thank you Abbi and Hannah. Looks great Hannah! As I said, it was a lot of fun for me, thinking about my cooking and how it has evolved. Eggplant never seems quick to me, so thanks for your recipe, Abbi! Love reading about how you learned from your mom and how you now cook with your kids. Fabulous article made even better by the photos of your sous-chefs!